Over the years here at GreekMedicine.net, I have heard from various people in Greece, and many of them were seeking to revive or resurrect, in one way or another, various aspects of Greece’s glorious past and hallowed wisdom and traditions. Most recently, I heard from an American expatriate living in Greece who was interested in starting a healing center on the island of Kos, which is where the great Hippocrates, the Father of Medicine, and the Father of Greek Medicine, lived and taught. It would be a center for spa treatments and medical tourism to awaken interest from abroad in Greek Medicine and its ancient healing traditions, and it would also be an educational center for conducting seminars and retreats, to educate both foreign tourists, as well as practitioners from both Greece and abroad. And by reviving traditional Greek healing knowledge and practice, it would also be serving the health care needs of the local Greek people. Jesus once remarked that a prophet is seldom recognized in his own country. Many times, people take for granted and fail to adequately appreciate what is their own, while clamoring for what is new, and what seems to sparkle brighter, from foreign lands. In music, I have heard that many Europeans have a deeper appreciation for American Jazz than most Americans do, for example. And such may well be the case with Greek Medicine. When I visited the headquarters of CCRUM (the Central Council for Research in Unani Medicine) in Delhi, India while I was in the process of putting up my website, there was a large mural on the wall entitled, “The Caravan of Greek / Unani Medicine”, depicting a grand odyssey that originated in the Greek homeland, on the island of Kos, but which grew over the centuries to span three continents, stretching all the way from Moorish Spain in the West to Malaysia and Indonesia in the East. What if, after all these centuries of tireless wandering, Greek Medicine were to finally return home to its native Greece? That would be a prodigal son story of epic proportions! It turns out that Greek Medicine, as Unani Medicine (Unani is the Arabic word for Greek) really took root, flourished and continued to grow and develop in the Arabic, Persian and Muslim lands of the Middle East and South Asia, whereas in Greece, and in the rest of Europe, traditional Greek Medicine became regarded as antiquated and outmoded, especially after the Enlightenment and the Scientific Revolution. But in countries like India, Greek Medicine, as Unani Tibb, continued to grow and progress, until today it is supported in its medical schools, research centers, hospitals and clinics by the Indian government’s Ministry of Health and Family Welfare alongside better known systems like Homeopathy and Ayurveda. Unani medicines and treatments have won broad based popular support as being gentle yet effective, and modern clinical research has proven the effectiveness of many of these medicines and treatments. India, as a developing third world nation with limited financial resources, has chosen, as have others, to continue researching and developing the healing resources and wisdom of her indigenous traditional healing systems, like Unani Medicine and Ayurveda. Many treatments of these traditional healing systems are just as effective, but less costly, and have fewer negative side effects, than modern medical treatments for the same diseases and conditions. If the access and availability of these traditional healing systems and their alternative treatments is improved, the nation’s health care dollar is able to go much further. 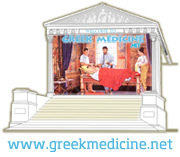 One of the first things a student of Greek Medicine notices is how absent Greek Medicine is from modern Greece. On previous trips to Greece, I have met various individuals who had their own reconstructionist ideas of reviving Greek Medicine as a functional healing system, but no one had put together a complete, comprehensive system that really worked. “Greek Medicine for the Greeks!” would be a nice slogan to emblazon on a tee shirt, for example, and one that is painfully obvious to anyone who has done a little thinking on the matter. After all, Greece gave the gift of civilization to the whole Western world – and that includes its classical medical system – now why won’t they proudly reclaim their healing heritage? Of course, the natural place for a revival of classical Greek Medicine would be, above all places, the Aegean island of Kos, which was home to Hippocrates, the Father of Medicine, and his Koan school. From this epicenter, the waves of new and revolutionary ideas that he set in motion regarding the theory, philosophy and practice of medicine would spread to some of the farthest reaches of the world. Before this American expatriate lady contacted me with her idea, her vision, for a healing center on Kos, that whole idea had been nothing more than a nebulous generality to me. But now I think that it is an idea whose time has come. What makes this an idea whose time has come? Why doesn’t Greece now do as India and other developing nations have already done – to integrate the cost effective treatments from her traditional or classical healing system into her present day system of health care? The realities of Greece’s broken health care system are, in many ways, similar to those faced by the US, to which it is often compared – runaway costs, poor affordability, and too many people left uncovered and falling through the cracks. But in the US, such medical experts as Integrative Medicine pioneer Dr. Andrew Weil have advocated the integration of complementary and alternative medical systems, including those of traditional healing systems like Greek Medicine, as a way to lower costs and improve affordability, while also, in many instances, reducing negative side effects and improving patient health care outcomes. Since India is where Unani Medicine, which is the heir to the healing tradition of classical Greek Medicine, is the most highly researched and developed, Unani Hakims (physicians) from India could serve as consultants and advisers to the Greek government if it wishes to improve the cost effectiveness of the Greek health care system through the integration of traditional Greek and Greco-Arabo-Persian medicine back into its overall regimen of health care. Obviously, such an effort would require a mass movement and persistent efforts at organization and reform that would be far greater than any single individual could bring about. Such a national effort would involve scientists, doctors, researchers and experts in both modern medicine as well as traditional Greek / Unani medicine to decide, for each disease or disorder, what the best and most cost effective treatment, traditional or modern, would be, and how best to incorporate traditional Greek and Unani medicine into the nation’s health care system for the best cost effectiveness and patient outcomes. In such a process, clinical results would be the bottom line, the final determining factor. This reform process would also involve persistent and sustained political effort and consensus building by legislators and public health experts as well. For medical tourists visiting a healing center or spa on the island of Kos, or elsewhere in Greece, the historical authenticity of the cleansing, detoxification and restorative treatments they receive would spark international interest and tourist draw, while bolstering the national pride of the Greeks themselves in being the fathers and progenitors of the healing art in the Western world. For health care providers to the Greek people, clinical results, cost effectiveness and patient outcomes will be the central concern in the healing of Greece’s broken health care system. The Herculean task of actually mending and reforming Greece’s broken health care system will have to be undertaken as a mass collective effort by the Greek people themselves, in whatever way, or to whatever extent, they feel inclined and able to do so. All I can do from this virtual forum, and with this blog posting, is to put forth the vision, and sit back to see how it will be received and implemented by the Greek people. This was written by David Osborn, MH - L.Ac. Posted on at 4:43 pm. Filed under Herbs, Traditional Medicine. Tagged Dr. Andrew Weil, Greek health care system, Greek Medicine, Hippocrates, integrative medicine, Kos, Unani Medicine. Bookmark the permalink. Follow comments here with the RSS feed. Post a comment or leave a trackback. ‹ Superfood Scammers – You Know Who You Are!